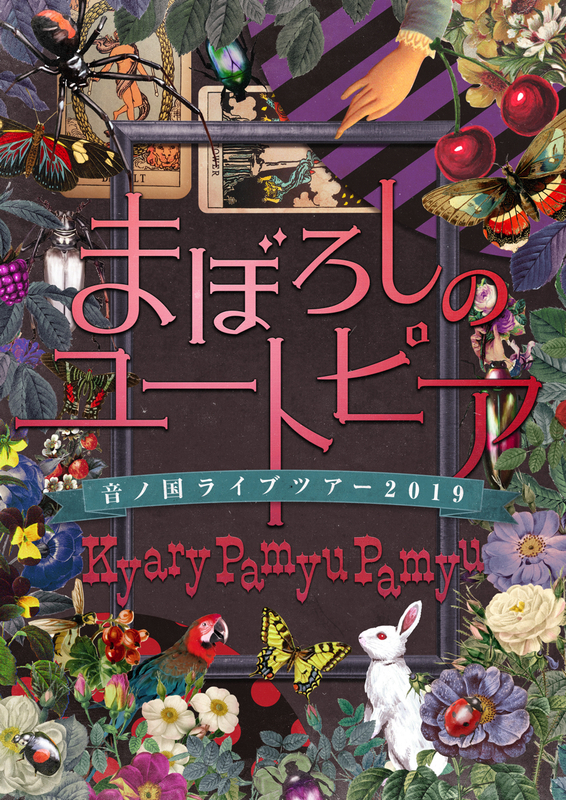 Kyary Pamyu Pamyu released her fourth studio album in autumn 2018. The album, which was produced by Yasutaka Nakata, takes an oriental approach. 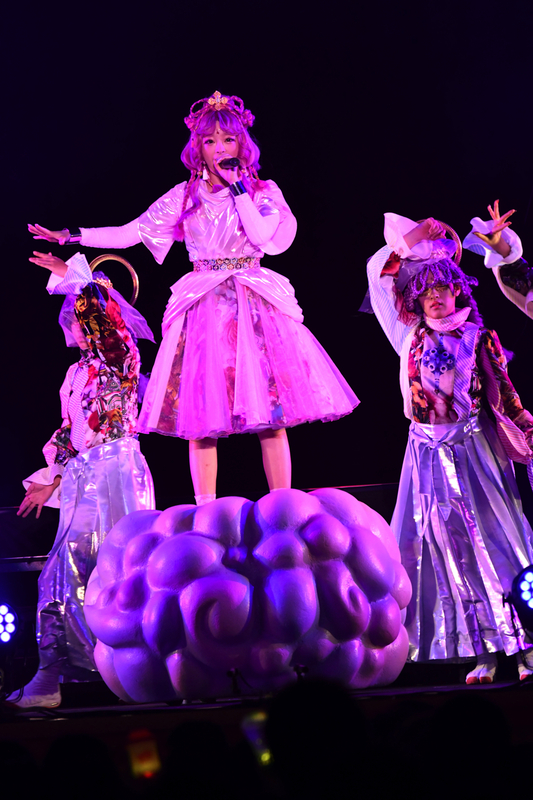 Kyary kicked off her live tour “Otono Kuni Live Tour 2019”, which was based on one of the most impressive songs on the album called “Otono Kuni”. 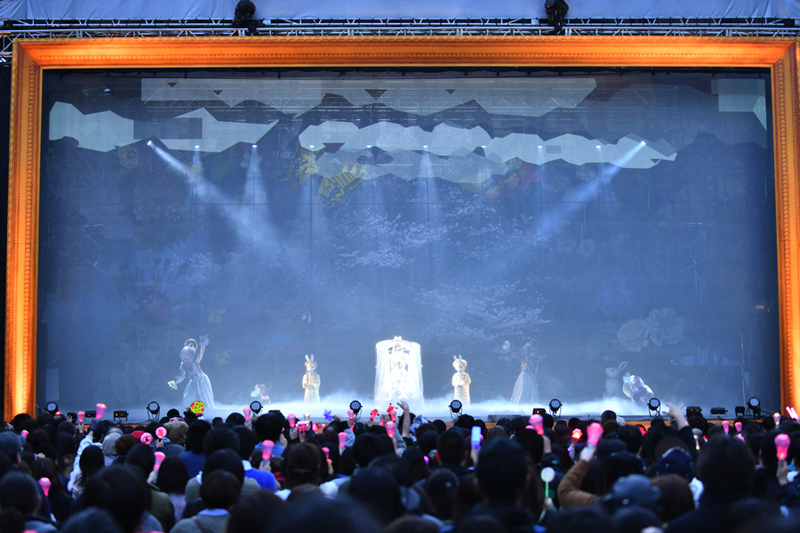 Kyary took to the stage at one of Japan’s most loved world heritage sites to enhance the album concept. On Saturday 30th March, Kyary Pamyu Pamyu kicked off her live performance “Maboroshi no Utopia ~Izumo-taisha no Yoru~” at Izumo Grand Shrine in Shimane, which is known to be the origin of Japan’s many gods. Japanese singer Akihiro Miwa, who is a big fan, praised Kyary Pamyu Pamyu on her performance: “You were like the reincarnation of Izumo no Okuni herself”, he stated, referring to the originator of Japanese traditional Kabuki theatre “Izumo no Okuni”, who worked as a server at Izumo Shrine. Kyary dressed in Japanese-style clothing decorated with gold chains and crystals. Although her fashion was criticised for not staying true to the old times, she also received compliments that her personal style as an artist has pierced through the generations and rules the times. As an artist whose outrageous fashion just cannot be comprehended, Kyary has jumped all over the world to perform at numerous stages. Now, with the words “the modern day Izumo no Okuni” spoken by Miwa kept close to her heart, Kyary pushed onwards and took over the stage at Izumo Shrine! As you walk amidst the majestic atmosphere when approaching Izumo Shrine, all of a sudden, you are faced with a giant frame surrounding a stage. Excitement rose as people wondered just how Kyary Pamyu Pamyu was going to present her story from inside the picture frame. The inside of the picture frame was decorated with plants that are often seen in European fairytale books, along with wild rabbits and butterflies. You can also catch a glimpse of a pop border and polka dots. You just can’t categorize this artwork into any time period or say it is based on just one country! It cannot be summed up as being “Japanese-style” either. This exquisite world is very Kyary-like! First, a movie-like opening played before the audience, through which the story was explained. The God of Music called the “Oto Ryu” protected the country of music (Otono Kuni) so that the people could live a peaceful life filled with fun and dancing. However, one day, this peaceful living was snatched away by an evil spirit. The God of Music was sealed away into a mountain and the plants and trees withered. The people forgot what music was and lost their smiles. The God of Music could sense the calamity from inside the mountain and began to cry. From the dragon’s tears, the Princess of Music; Kyary Pamyu Pamyu was born with the purpose of restoring the country’s smiles and peace. Gentle, orchestral music started to play, leading into the song! Kanzen Keitai”. 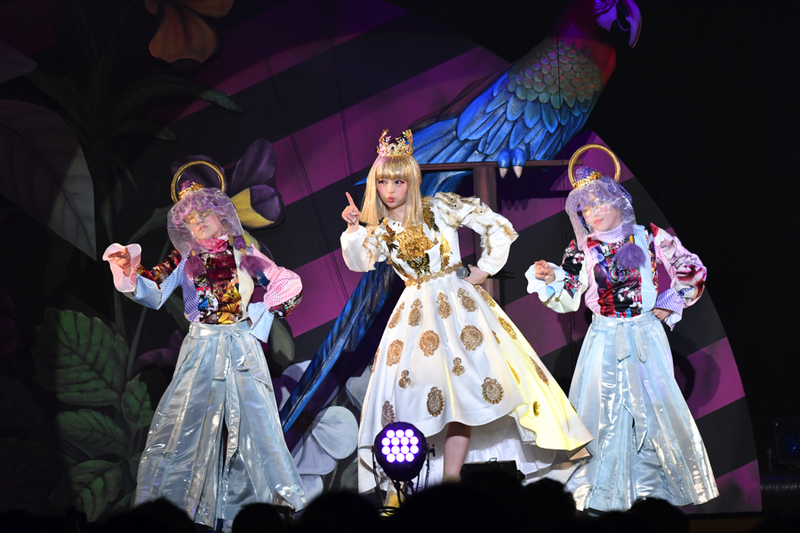 The majestic figure of Kyary Pamyu Pamyu was accompanied to the stage. Against the white curtains, her golden dress floated like a goddess – very much like the descendant of the god of Izumo. Kyary’s clear voice resonated through Izumo forest. For a moment, the audience was pulled into her mystical fairytale world. She did not just perform songs from her new album Japamyu, but also some of her songs she hasn’t performed in a long time from “Suki Sugite Kiresou”, “Noriko to Norio” and “Unite Unite” to her debut song “PONPONPON” which was a world hit! This line up was overflowing with variety and really kept the tempo going! 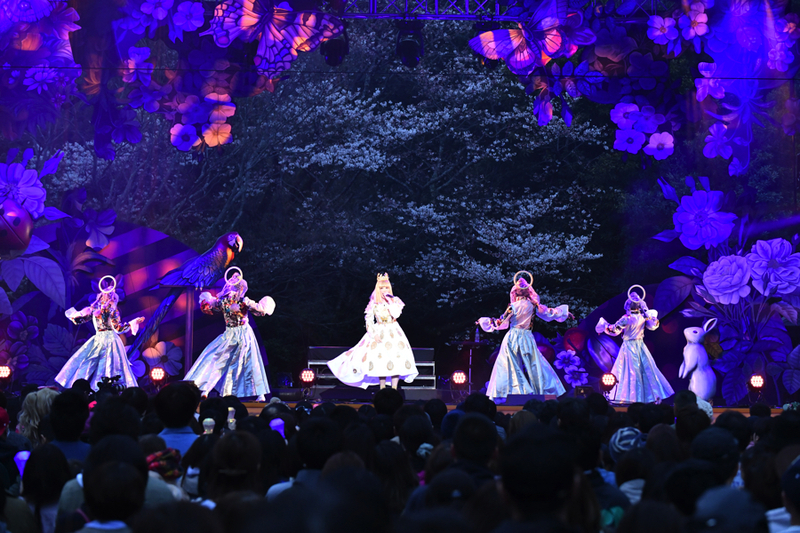 As the surrounding area got darker, the forest and cherry blossoms were illuminated with the lighting and the area became a mystical land. After another video was played on the curtains, Kyary returned to the stage in a cute and cool outfit! This time, she wore a Japanese-style pink dress and arrived on a pastel pink cloud! She then kicked off with one of her most famous songs: Ninja Re Bang Bang, but this time in a cappella style! This is the first time she has ever performed this song in a capella! After relaying her deep thoughts to her fans, she moved on to “Enka Natrium”, for which she taught her fans some easy choreography so that everyone danced as one! She then continued to perform some of her biggest uptempo hits “Invader Invader” and “Fashion Monster”, at which the climax of the night was reached. Then, with the power of Kyary’s music, the God of Music was freed from the mountain and came spiralling down to earth. The grand figure of the dragon could be seen projected on the curtains. 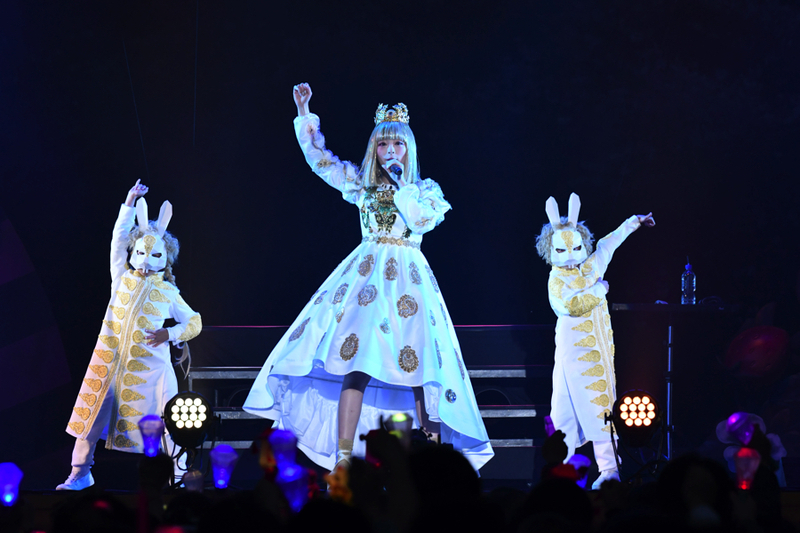 As this concluded the end of the main part of the live performance, Kyary immediately performed the main song of the evening “Otono Kuni”, which wrapped up the evening. Kyary Pamyu Pamyu’s then performed her brand new song KIMI GA IINE KURETARA for the first time! This song will be used as the theme song for the new drama ‘Mukai no Bazuru Kazoku’; the drama which is currently big news in the media! The theme of the song is SNS and was heavily inspired by the drama. Whilst singing her new pop tune with passion, she performed a dance with one dancer for the first time. She described the dance as the “most difficult she has ever done”. Kyary Pamyu Pamyu performed her original performance “Otono Kuni” in the special and traditional environment of Izumo Shrine. As we are approaching 2020, which is the year that Japan will host the Olympics, Japan is aiming to spread its culture worldwide now more than ever! 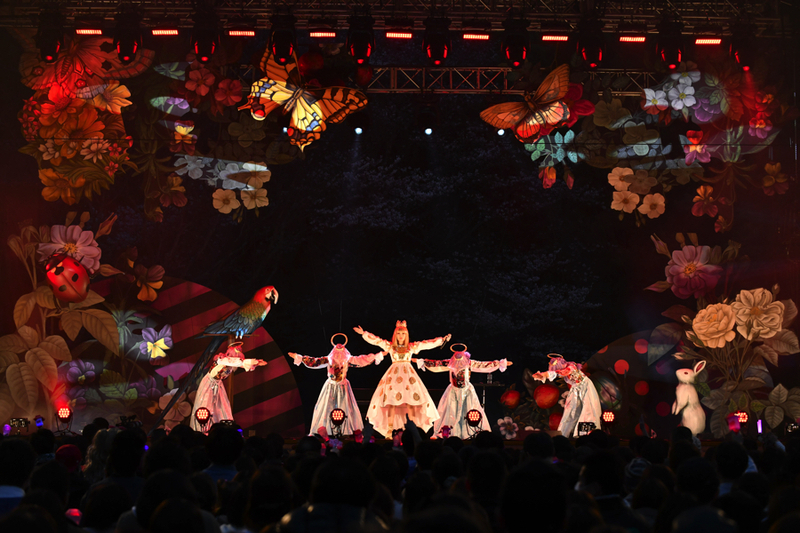 Kyary, who was compared to the founder of Kabuki theatre Izumo no Okuni, mixed traditional culture and innovation to present a unique show. This evening was living proof that Kyary’s unique culture is being spread worldwide. For the second part of her Otono Kuni Tour 2019”, Kyary unveiled her next venue to be Minami-za, the kabuki ‘holy ground.’ This tour will be a link to “Kyoto Mirai Matsuri 2019: Minami-za Reopening Commemoration”. On the last day of the Heisei era of Japan (30th April), Kyary will hold a collaboration live performance with Minami-za in Kyoto! This will be a one day-limited special performance called “Kyary Kabuki Kabuki”. 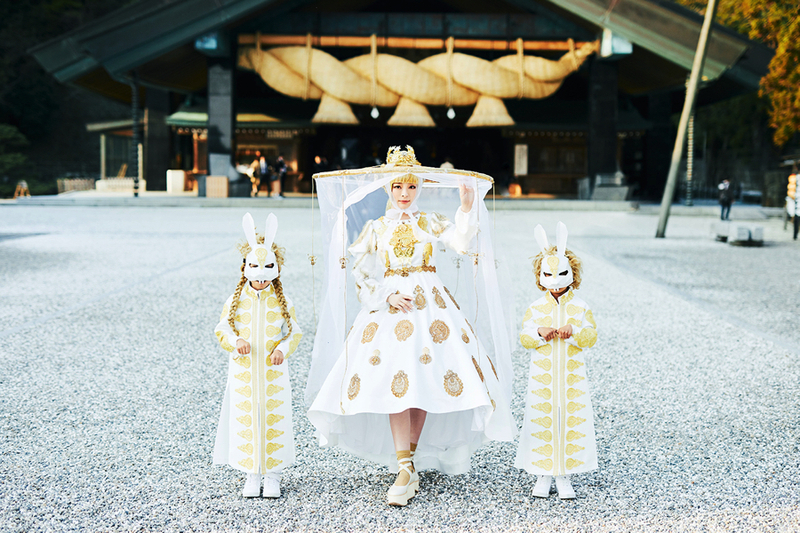 Kyary, who was compared with the founder of Kabuki herself, is sure to provide a dramatic collaboration performance! Just what kind of fusion of traditional culture and modern reform will she hit us with this time? There’s just no stopping Kyary Pamyu Pamyu! *Opening theme song for NTC drama series Mukai no Bazuru Kazoku, Yomiuri Telecasting Corporation.